Awww, thank you for voting everyday! I’m sorry TWC doesn’t always update in a timely manner. DX That can be a pain. Ahem, so if Coal’s 15, that’s would make Loki’s sons 10 or 12? Somewhere around there? Their ages tend to fluctuate in my mind, but I peg them somewhere around 8 to 10 years old. That active stage that allows for occasional downtime. Very occasional. Aw man I voted and it wasn’t updated for me yet either lol Ah well. Blah, I’m sorry it wasn’t updated for you yet either. D: I know it doesn’t really update till perhaps 3 AM Eastern. Um, eek?? DEATH FROM ABOVE! Though I also have a feeling he might a cuddly pet, lol. Ooh, architecture sketches, I want! Yes I am awaiting said comic. You and your cliffhangers. XP Thanks! Pet? It’s probably a sibling. Loki gets around. Not a bad theory. XD Who knows what stories were lost to us over the generations. I’m guessing it’s Loki actually. He is a shapeshifter after all, and he loves a good prank. It just wants to play. With sharp teeth and claws. D: Against cuteness. whats a einherji? or should I stop asking questions and wiki these subjects? Oh, whoops, I meant to explain that in the description but totally forgot! Sorry! “Einherji” is the singular form of “Einherjar,” the super-powerful warriors of Odin that Coal is now a member of. At least I hope it’s the singular. So I take it coal is not “fully” a einherjar as he didnt drink the entire horn back then. And as always great page, is the trees tiring to draw? Reminding you to help control the monster population. Have your monsters spayed or neutered. Haha, wise advice to anybody. i agree with her majesty, too cute, and almost predictable 😉 i thought that you were supposed to vote every day, i try to vote for my favs every day. Yes Einherjar is plural and Einherji is singular. not a Norse lover though just Icelandic. 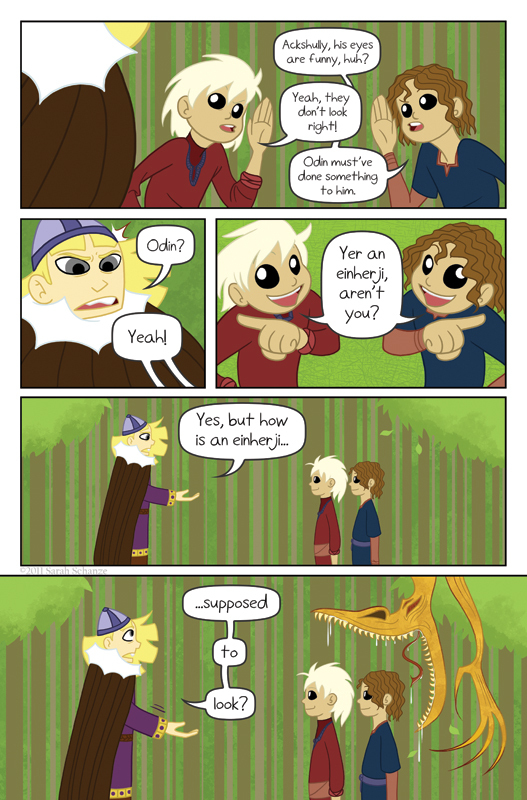 Love The Comic and Norse mythology so thanks for making my Þors day. Yaaay, I’m glad I was right. XD Thank you so much! I just discovered your comic! I am in love with the scenery and the characters so far! I have no knowledge of Norse legends so I’ll be reading and doing a bit of research to understand along the way. That creature in the last panel seriously freaked me out!